After their well-received 2010 album T/ME, released in conjunction with Abigor’s Time Is The Sulphur In The Veins Of The Saint, French industrial-kriegmongers Blacklodge are back, signed to Season Of Mist and ready to unleash their brand of technological Satanism on our ears. And it’s a formula that, despite being pretty much perfected by Dødheimsgard if not the legendary Mysticum, works very well, adding everything from breakbeats to Godflesh-esque pounding to the blackened palette, creating a hellish dance soundtrack to the end of times. Immediately catchy as well as engaging and gripping on a deeper level, MachinatioN is a very good album that should cement the band’s reputation in this particular subgenre. The hour-plus length works for rather than against the band, nearly double the length of T/ME, giving them the time and space to work out their songwriting ideas, with the skill to keep the listener gripped. 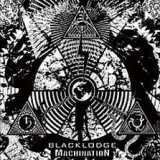 After all, it’s worth remembering that Blacklodge are no newcomers, having been in existence since 1998. They are underground to the core, their occult leanings a major part of the music – take Order Of The Baphomet as an example, starting with sampled speech which then turns to laughter, speedily cut up and mixed into the flurry of beats and distorted riffs that begins to emerge. This is by no means black metal with shoehorned in disco beats, but a fully-realised vision that combines the various elements in a complete realisation of vision. Outright digital blastbeats on TridenT and Empire’s Hymn work differently to the usual organic cacophony, being somehow smoother and colder, removing the music even more from the world of men. There’s a good variety of songs, from less structured pieces of dark ambience like closer The Other Side to things that wouldn’t sound out of place coming from Aborym (NeutroN ShivA (Sun, Walk With Me!) is particularly reminiscent of the Italians’ older material). Industrial Temple MysticA is one of the best tracks, mixing spacey atmosphere with a good mixture of beats and bleeps to create a well-rounded song. Looking back over their past discography, it’s clear that Blacklodge have refined their sound but not significantly altered it. Yes, MachinatioN may be less raw than the likes of Solarkult, and more mid-paced than black metal’s usual gallop, but it’s just as good at creating the sort of icy atmosphere that the best black metal can, futuristic and hopeless, nihilistic and despairing. Fans of the very early material may find the likes of Culto al Sol (SolarKult) a bit too much on the catchy side, but the carefully-paced likes of Neo.Black.Magic are close enough to the modern post-black rumble to more than fit on the dark side. Newcomers and those who still worship at the altar of Dødheimsgard will love this.